I am personally deeply troubled at the current state of affairs in the Ukraine. But I am not only troubled by Russia’s unfortunate incursion into Crimea- the seemingly inescapable repercussions are distressing as well. First of all, I will outline my view of this situation. Russia does not want war. 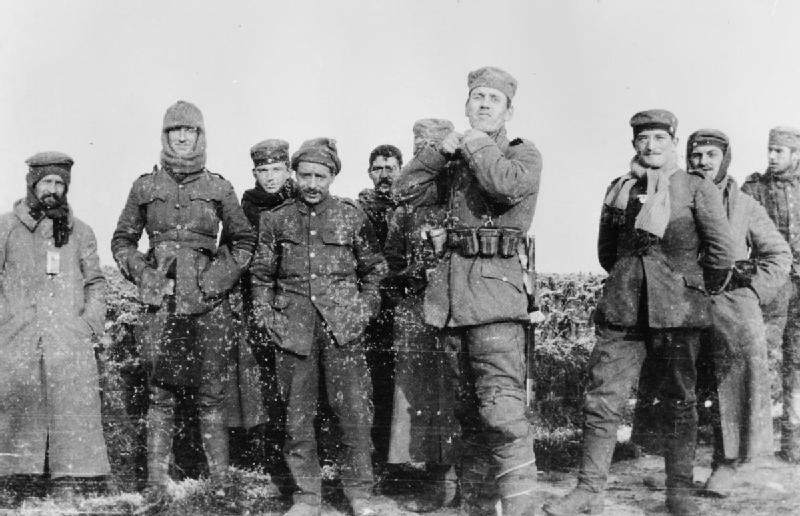 Its actions are based on the strong Russian identity, which exists for ethnic Russians across national borders, and on historical precedent. Until 1954, Crimea was a part of Russia and there are over one million Russians living there today. Conversely, the Ukraine has not historically appreciated being associated with Russia- in World War II, numbers of Ukrainians welcomed and sided with the invading Wehrmacht- and much of the country, as evidenced in the recent protests, is pro-EU and anti-Russia. 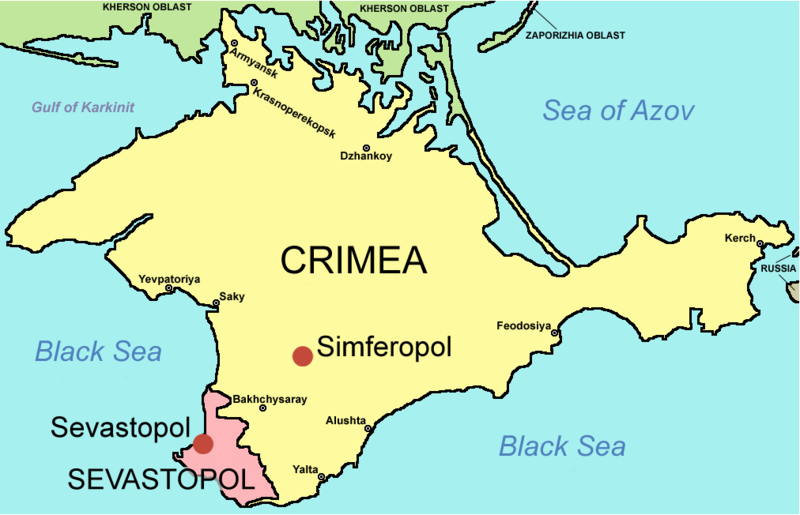 Map of Crimea: from Wikimedia Commons. Attributed to Soerfm. What is unfortunate, of course, is that Russia has reacted to the protests with such eager inhibition- although I can understand its reasoning for doing so. Crimea has such a large population of ethnic Russians that Russia does not want to risk alienating or endangering its people. As soon as the protests turned violent, Russia decided that it needed to act in order to ‘save’ its people from violence and instability. My hope is that Russia will not inadvertently cause more unrest by going further into the Ukraine’s territory. 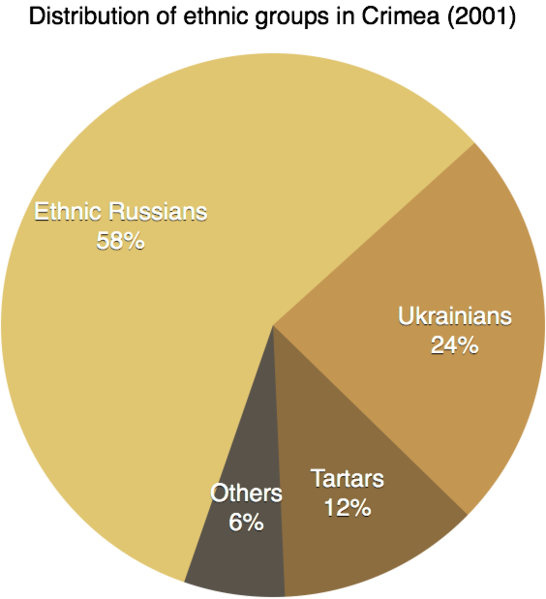 Graph of Demographics in Crimea: from Wikimedia Commons. Attributed to Soerfm. But I do not believe that Russia is solely to blame for this incursion. In all things, I believe Russia acts under the assumption that it is alone. It cannot count the West as an ally, since we here in the West have done nothing but belittle and criticize Russia since the fall of the Soviet Union. I came across an article by Angus Roxburgh today which raises some valid and thought-provoking points about the West’s involvement in this situation. You can read this article here: http://www.telegraph.co.uk/news/worldnews/vladimir-putin/10695204/Paranoia-leads-Vladimir-Putin-to-the-point-of-no-return.html. Such an article brings up this question: What has the West, or for that matter, anyone, done to encourage global peace and cooperation after the dissolution of the Soviet state? It is sometimes said that humanity learned its lesson after the horrors of World War II, but have we? Can we honestly say, after a long look in the mirror, that we are doing a good job in the pursuit of peace and cooperation? I believe that we are failing. World leaders have legitimate concerns in looking after their own countries, but in this age of globalization, with the Internet and the United Nations and wireless communication, countries now have a duty to the world as a whole as well. And yet world leaders still seem more concerned with their own agendas and their country’s power and prestige rather than the real concern of global peace. And can we say that the Cold War is truly over? I’m not so sure that we can- the Cold War that purportedly lasted from 1947-1991 was defined by espionage, lack of communication, and proxy wars. The West and Russia still spy on each other today. John Kerry and Sergei Lavrov still boycott the odd meeting and call each other’s actions ‘unacceptable’ and ‘irresponsible’. 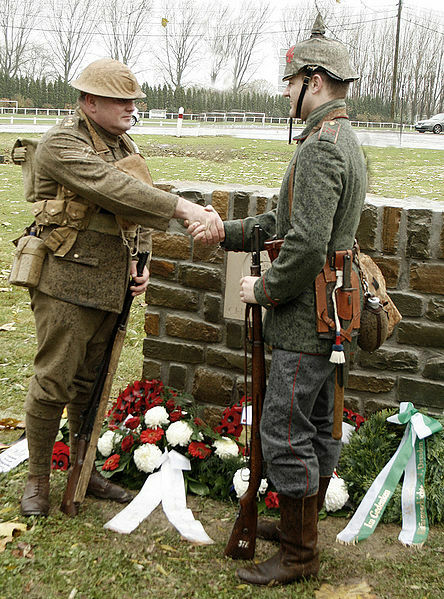 And each respective country has its own set of allies and interests which conflict with the other’s. Instead of the Soviet Union, Cuba, and North Vietnam against America and the West, we have now Russia arming al-Assad in Syria and Western powers supporting the rebels. How is the conflict in Syria anything but another proxy war? 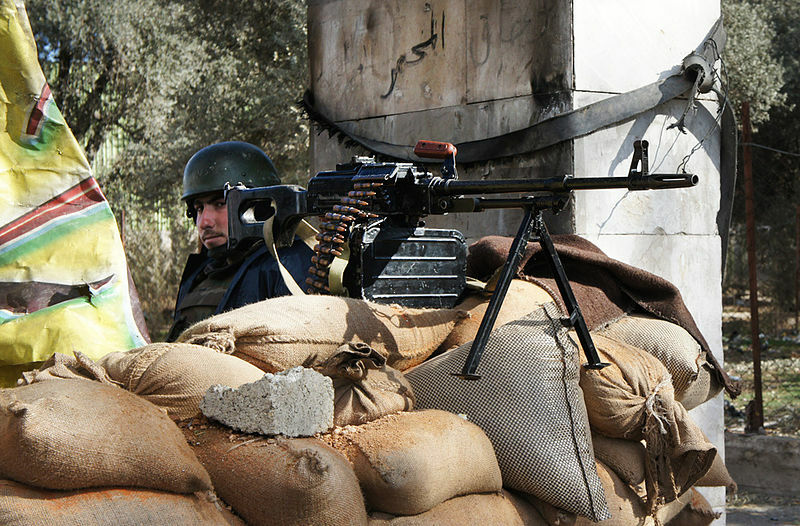 Photo of Syrian soldier with Russian-made PKM machine gun: from Voice of America via Wikimedia Commons. Attributed to Elizabeth Arrott. Additionally, NATO still remains a force in the world; a force which threatens Russia’s sense of security thanks to plans like the one to build a missile shield in Europe. We should not be at all surprised that Russia is reluctant to listen to Western ideas, or to comply with Western demands. Why should Russia do anything for us when we have never done anything for them? I am not trying in this post to assign blame to any one party, because the blame belongs to all. Fifty years of suspicion and bad blood cannot be erased, but it can be learned from. My worry is that no one is bothering to learn from it. There comes a time when we humans must wake up and take things seriously- forget our pride and our greed and our selfishness, and ask what we can give to make things better. Now is surely that time, time to stop insisting on the faults of other nations and instead to commit to remedying our own. I’m sure that world leaders would have many excuses that would discount my pleas. They have their own security to worry about, of course, and there are some actions which cannot be ignored. True, but giving of yourself and reconciling would mean you would have one less enemy to worry about. And although there is true evil in the world, Russia is not it. Nor is the West. Both may be self-serving and pigheaded, but they do not embody evil. And consider, for a moment, the consequences if world powers do not make some sort of radical attempt at understanding and helping one another. The next century will be built on layer upon layer of suspicion, doubt, and animosity- a foundation which will only serve to hurt its builders in the face of growing threats like terrorism and extremism. Do we really want another fifty years of a Cold War? Perhaps we actually enjoyed the Cold War and its five decades of ‘Red Terror’, senseless conflicts, and nuclear proliferation- after all, no one seems to be making much of an effort to avert its continuation. How long will it take before we see a real war, given the way events have been escalating in recent months, with Syria, Ukraine, and differences in philosophy between Russia and the West? 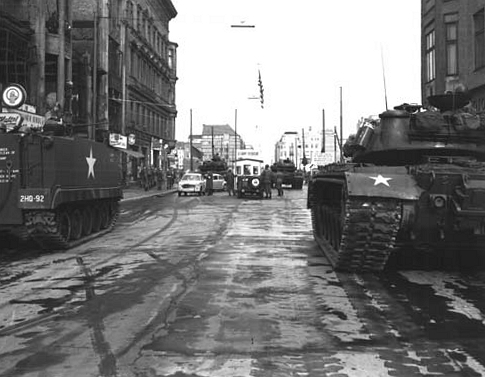 Photo of 1961 Checkpoint Charlie standoff: from http://nsarchive.chadwyck.com/bcphotox.htm. Attributed to unknown author. I will not be surprised if some people disagree with or discount my estimation of this situation. But I do not believe I am misguided. Although my knowledge comes only from one university course in International Studies and regular online and literary research, it is clear that the current methods being used in international affairs are not working and perhaps we should try a more sympathetic approach. Instead of demonizing everyone who disagrees with us, why can’t we try to understand their position and see what type of unilateral effort we can muster to change the situation? Again, I view all the current conflicts as extremely unfortunate yet entirely avoidable. For whatever reasons, we have not taken the opportunities that may have allowed us to coexist with better cooperation and understanding. I do believe there is still time and hope (and no immediately impending apocalypse), but we cannot ignore the fact that things will continue to get worse if we do not make them better. I can’t even pretend that this post will make any kind of measurable difference, but public sentiment is a powerful thing and I hope that my post may influence that sentiment and promote awareness. Why don’t we try to do some good in the world, instead of always antagonizing the easy targets? So many of today’s problems are wholly of our own making; if not intentionally encouraged, then egged on by our own selfishness and inadvertent sense of superiority. 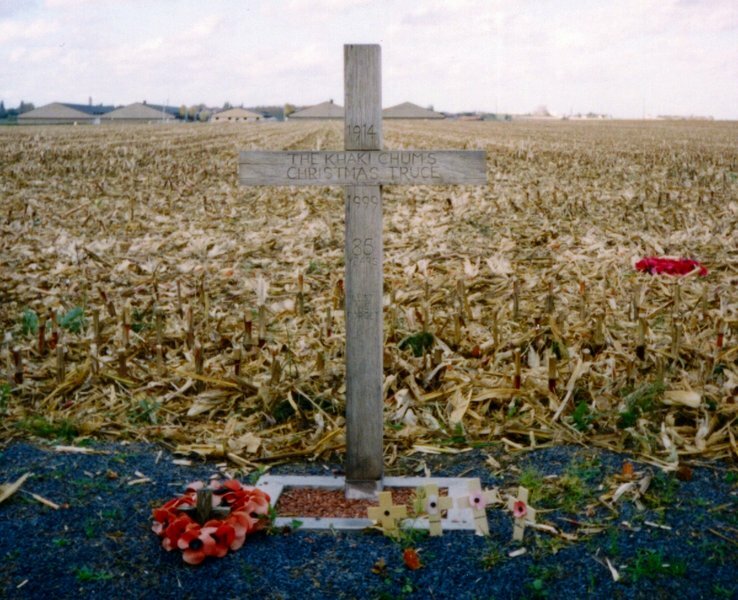 Surely we don’t want to be mired in the depths of a cruel and fierce war in twenty years, fighting someone who could have been a friend, and looking back at all the opportunities we shunned and wishing we had not been quite so proud and stupid.